Okay, trout are definably on what we would say “the hunt”. They are hungry and looking for anything to eat! They’re mostly eating live bait like shrimp and white bait. When you find an area with plenty of trout, try changing up to soft plastics and have some fast fun. Soft plastics are a very good way to cover a large area quickly. Most of the time you’ll find the fish stacked up in the potholes at low tide and along the bars throughout the harbor. These are prime spots for tossing soft plastic. Many times when you find a good spot with plenty of trout, you’ll probably be catching just about everything… snook, reds, trout…oh and don’t forget the all elusive channel cat! One of my other favorite fish finding baits would be a shrimp and a popping cork. Bomber makes one that is very hard to beat. The Paradise Popper has a titanium wire which is very strong and will hold shape even after the most brutal of onslaughts. Another effective way to rig that cork other than the traditional 24 inches of flouro and a 6/0 circle hook is to substitute that circle hook for a ¼ oz jig head and soft scented plastics like mirro-lure’s lil’ jon or a Berkley gulp shrimp. With this method you get the best of both worlds the noisy popping action and the speed of the jig. I like to fish this if I am in a situation where my bait is limited. This time of year the hot bite can be on shrimp one day and something else the next so it doesn’t hurt to pick up a few dozen live shrimp every time you go fishing because snook and reds love them as well. We’ve had very mild weather for the most this year… and there are still plenty of snook popping under the mangroves so try the topwater baits throughout the day. I use them as an indication of how aggressive the bite is. If they blow it out of the water then I’d say they are pretty active and keep slinging it. If they swat at it lazily and are not really crushing it then you might want to assess your approach and either slow down the retrieve or switch to another bait that you can work a little more slowly like the jig and popper cork I mentioned earlier. If we can get the wind to back off a bit I’d also recommend some of the near shore reef fishing. Soon the sheepshead will stack up on the artificial reefs and live shrimp will dominate as the go to bait choice. The beaches are still very productive as are our pass fishing like Boca Grande. Get out to the beaches or run out of a pass… all it takes is a half mile or so out off the beach… back down the throttle a bit, and look for the birds or fish flying out of the water. 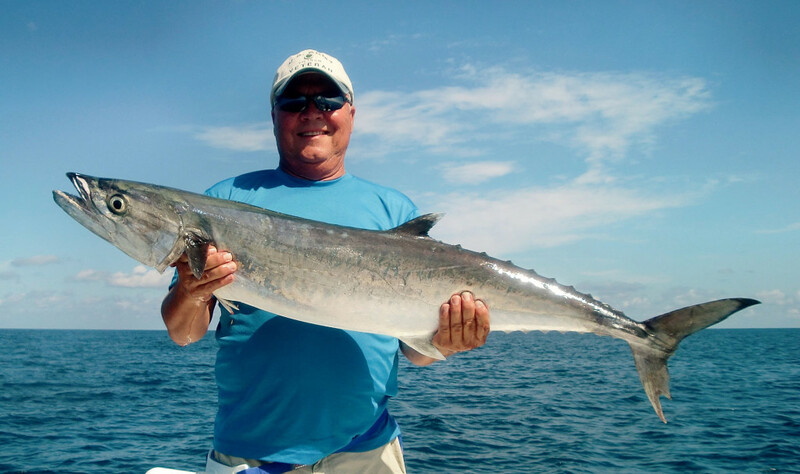 You’re sure to find large schools bonito and spanish mackerel. The outgoing tides are going to be the hot ticket as it dumps any remaining bait out into the Gulf. Flounder move offshore in the fall and winter months to spawn, so when you find some… there should be more in the area. Watch your bottom machine for structure and drops and work around them with those live shrimp as well. Some really nice flounder have been the guest of honor at several dinner tables lately so keep an eye out for them. Out on the beaches and out several miles be on the lookout for bonito, black fin tuna, spanish and king mackerel. Mackerel are making their fall run and are in big numbers and offer a great opportunity to bend a rod. Scoop up a few nets of big threadfin herring and see why we call them “smoker Kings”. Just look for the birds and keep your head on a swivel while running from one spot to another and I’m sure you’ll spot them with ease. If you’re ready to get out and see how Kelly and I do it, give us a jingle at 941- 698- 0323. You may also find us on Facebook, Instagram or our web page www.FloridaInshoreXtream.com. Well folks, you know the deal…gotta get on out and get my FIX on! So … tight lines and y’all stay safe! !